Notrax T17 Super Foam Anti-Fatigue Mats are made from state-of-the-art lightweight closed-cell PVC Nitrile foam. These are excellent mats for a wide variety of uses, from factory lines to home offices with sit-to-stand desks, any place where a heavier, bulkier mat won't do. 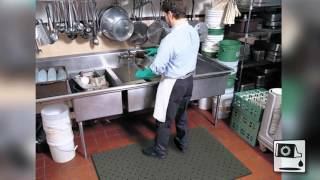 The Notrax T17 Super Foam Anti-Fatigue Mat is also highly resistant to liquids, greases, oils and animal and vegetable fats, making it a solid choice for food service applications. The Notrax T17 Super Foam Anti-Fatigue Mat is available as a mat or full roll.